SAGINAW – They groaned. They grumbled. They applauded each other and jeered references to a certain politician. Sixty-five people crowded into a meeting room at the Saginaw Intermediate School District Tuesday evening for a public forum on proposed changes to Michigan K-12 social studies standards. Waterford, 6-8 p.m., June 20, Oakland Intermediate School District, 2111 Pontiac Lake Rd. Sault Ste. Marie, 6-8 p.m., June 26, Eastern Upper Peninsula Intermediate School District, 315 Armory Place. Lansing, 6-8 p.m., June 27, Michigan Library and Historical Center, 702 W. Kalamazoo St.
Grand Rapids 6-8 p.m., June 28, Kent Intermediate School District, 2930 Knapp St. NE. Forums that were attracting 2-5 people before the June 12 article have grown large and loud. An event in Cadillac on June 13 drew about 20; a meeting in Flint on Monday grew to about 50 people before the Tuesday meeting in Saginaw, all of whom appeared to be unhappy with the conservative-leaning changes to standards. Those revisions were influenced by a 21-person focus group that included Sen. Patrick Colbeck, R-Canton, and several other conservatives who persuaded the group to make changes in which historic events, topics and groups must be examined in Michigan classrooms. 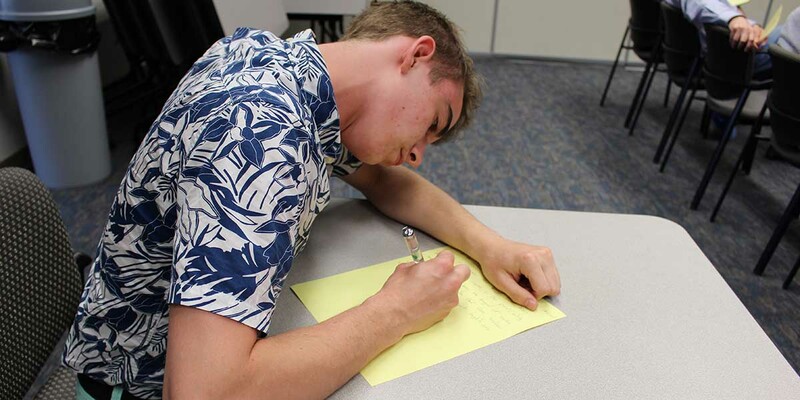 Colbeck said his suggestions were motivated by concern that some standards are not politically neutral or factually accurate, and to ensure students are exposed to multiple points of view. Critics raised suspicions that politics had slipped into what students must study in kindergarten through high school. In the week since Bridge chronicled the changes, online comments received by the Michigan Department of Education expanded 10-fold. Public interest has grown so much that MDE is adding more public forums across Michigan for residents to weigh in. 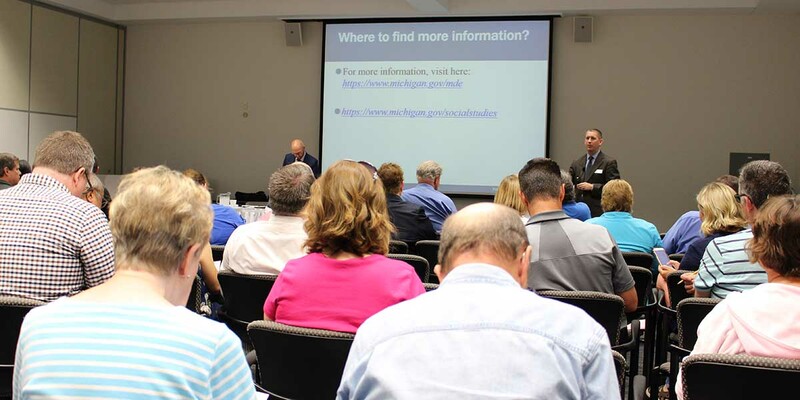 Two of the new meetings will be in Lansing and Grand Rapids – communities where forums were sparsely attended before the standards gained statewide attention. Public comment is being accepted through June 30, both online and at the forums around the state. 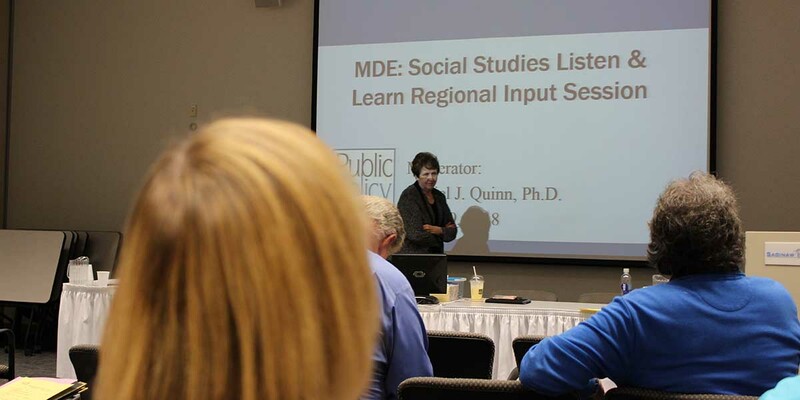 “We are pleased with the amount of attention the proposed standards are attracting,” said Linda Forward, director of the office of educational improvement at MDE. “We are also pleased with the responses that we are receiving. Michigan’s social studies standards were last changed in 2007. The education department has been working to revise them for four years. The standards were revised by a 14-member team of educators and subject experts. Over the past year, 21 people representing diverse racial and ethnic groups as well as more educators tweaked those standards. That last group included four well-known conservatives and Colbeck, who is running for governor ‒ but no Democratic activists or politicians. One question posed to MDE officials in Saginaw on Tuesday, “Why was only one legislator in the focus group, and why allow a Republican without also having a Democrat?” was met by applause. Forward told the crowd that Colbeck was included on the committee revising the standards because he’d written a letter to Michigan Schools Superintendent Brian Whiston complaining about the current standards. More groans from the audience. “When we learn about history, we don’t just take a poll and determine whether we are a democracy or a republic,” said Andrew Wehrman, a history professor at Central Michigan University who attended the Tuesday forum. In response to complaint after complaint Tuesday, MDE officials said they would take all the comment cards filled out at the meeting back to Lansing and consider them when weighing changes to the standards. “That’s why we’re here,” Cameron said. Several people scolded MDE officials for what they viewed as allowing the revision process to be hijacked by political partisans. “You should not have made yourself so susceptible to a people who have a history of being ideologues,” chided Tom Pedroni, associate professor of curriculum studies at Wayne State University in Detroit. 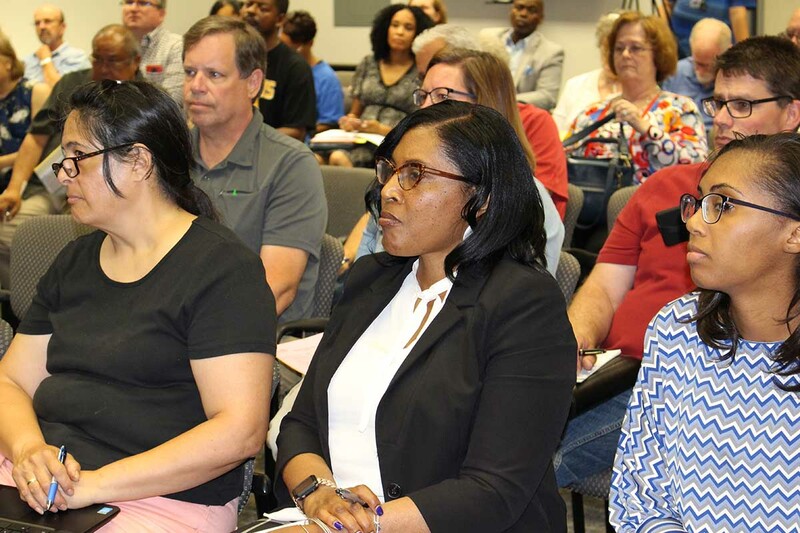 Though there were 14 people involved in writing the revised standards and 21 who participated in a focus group that revised those revisions, the crowd in Saginaw focused on only one: Colbeck. The state senator told Bridge that he was instrumental in getting the d-word removed from “core democratic standards,” saying the phrase wasn’t nonpartisan – a claim that caused the Saginaw crowd to laugh. Colbeck hasn’t attended any of the public forums on the standards that have been held around the state so far, according to education department officials. The education department is accepting public comment online through at least June 30 – a deadline that may be extended if comments continue to flood in. The state board is scheduled to receive an update on the standards and public comments at its Aug. 14 meeting. Pugh said she doesn’t anticipate the board voting on the standards at that meeting. She confirmed what Bridge reported late last week: that she and the other three Democrats on the board will vote against the standards if they remain in their present form. Even if the four Republicans voted for the standards, a 4-4 tie would mean the revised standards wouldn’t be approved. So...will we strike "republic" and/or "democratic" from describing the US depending on what political party is in power? That is the stupidest thing ever...and to think that we can't TEACH KIDS the difference between the word Republic and what the Republican Party is and the word Democratic and what the Democrat Party is...well, that just tells me that we don't think very highly of our kids ability to grasp larger concepts. It's sad, disheartening, and wrong. "Well, yes, the US is a democracy, but we don't want to call it that because it might confuse kids thinking it has something to do with the Democratic Party." - says one idiotic Republican who shouldn't have won his race. An equally asinine Democrat legislator retorts, "Well sure, the United States is a federal republic composed of 50 states...but calling it a republic sounds too Republican and too partisan; it could confuse kids." ...I'm starting to hope global warming or aliens kill us all sooner than later. If adjectives are not acceptable, as in "core " and "democratic", then perhaps the noun "values" is not acceptable, either. Perhaps the intent in eliminating words is to eliminate thinking. The beauty of our nation's founding and growth is the diversity of our people. Humans thrive on freedom of thought and generosity toward others. Rising from our common experience, these are but two of our "core democratic values". Public education is the institution that realizes the adjective in the name of our country, the UNITED States of America. If you prefer to have your students swimming in a pool of popaganda rather than learning about history, economics and civics, then vote for Republicans in November. That's exactly right, Joel. Lying does not seem to bother them one bit, it's a way of life!!! If MDE is allowed to tilt the Social Studies curriculum to the demands of right wing Republicans, look for their attempts to change other curricula such as Science next. Creation "science" anyone? Just another reason to move away from Michigan. No jobs, crazy politicians, and declining educational standards. It would be interesting to learn the political leaning of Bridge readers. My guess is that they are mostly liberal. If that is true, then of course something advertised on Bridge would be heavily attended by anti-conservatives. Postmodern social science scholarship is built around making history a long recitation of grievances and making each and every event, interest group and occurrence equally relevant to our current reality. It should be no surprise that there is no middle ground. Another "tea stain" spreading its filth across the fabric of our county. To propose eliminating the concepts like climate change and LGBT suggests a full on religious intolerance and propaganda led education for brainwashing indoctrination. Welcome to the Machine. Your article says that educators were involved in the revision process. I believe this is a bit misleading, as I was told there were not any current teachers involved. Only professors, MDE officials and ISD consultants. Again, the professionals who actually have to use the document were left out of the process, as with so many other changes in education. Someone needs to explain what "standards" mean and are in this context. Otherwise the content of this article and discussion are misguided. 65 people showing up for this event is not an "explosion", it's the equivalent of two elementary school classes. Ha, fair point. However, when you compare it to the handful of folks who were showing up before the debate became public, it's a lot. But point taken. p.s. The Ann Arbor Public Schools Board of Education unanimously signed a statement opposing the proposed standards. Ask your School Board to do so as well. Feel free to e-mail me for details. Kudos to Bridgemi.com for this coverage. Did I read correctly that "contemporary global issues" was changed to "current policy debates" in the proposed standards? How will this change affect fact-based material? Are all issues really policy debates? I'm in need of some enlightenment. If we eliminate the word "democratic," should we not also eliminate the word "Republic"? That would make the Pledge of Allegiance quite interesting! Democratic, a word that has been used throughout the history of our nation, is not a word that indicates a political party, any more than the word republic. These words describe our government in it's ideal form, a form that we continue to strive to attain. Mr. Colbeck and his crew show an inability to understand our government and history. Another one of his proposed revisions that I don't understand is his desire to delete examples in each standard. Examples provide clarity for teachers, just like teachers provide examples to their students. Why would he object to clarity? 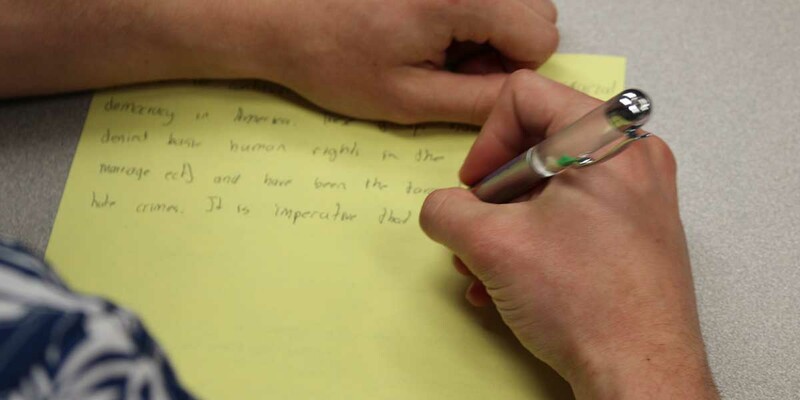 Please leave writing the Social Studies Standards to social studies teachers. Men and women who have made teaching their lives do not need a politician to hijack their professional experience and wisdom. Democratic should not be removed from "core democratic values". LGBT, NAACP, and the KKK should not be minimalized. There roles in history are important like it or not. Roe v Wade should remain since it is an important part of history. My biggest concern is that Mr. Colbeck was allowed on this committee without equal representation of a democratic politician and his views were politically motivated. I tried completing your 'comments form' several times without success. Are you trying, purposefully, to discourage comments because of the anticipated outrage that will be coming your way? An “educator” not teaching something because it might be confusing?!! What’s the point of any of this then? Let’s just throw out the whole curriculum because teaching is hard. Good grief. The whole point of social studies is to inform us of our history, to examine how we got here, and to teach critical thinking so we can use knowledge of our past to shape our future. Knowledge is power, and if the curriculum leaves out references to key groups, issues, and topics, discussion and analysis of why those things were/are important will also be missing. History will be doomed to repeat itself if we don’t learn from our past. This curriculum takes power away from the students (our future leaders and global citizens) to be fully informed when making important decisions regarding our collective futures. I don’t think it’s the term “core democratic values” that leads one to wonder whether Republicans have democratic values . . .